This Saturday 01 July, Exchange Square in Broadgate will come alive with dancers from across east London, as part of Melanie Manchot’s new commission Dance (All Night, London) showcasing styles from Cuban Rueda to 80s funk and Argentine Tango. Between 10pm – 1am, the square will be taken over by teachers from each school, offering different dance lessons to the public. When the lessons are over the space becomes an open dance floor until the early hours of the morning, with playlists and headphones available via silent disco. We speak to Melanie Manchot’s about creating work for public spaces and how dancing with strangers can be ‘a powerful act’. Why did you want to be part of Art Night 2017? The concepts for Art Night 2017 speak to many of the core ideas I am pursuing in my practice as a visual artist and Art Night 2017’s curator Fatos Ustek is one of the most exciting curators to work with. Her way of programming and curating is innovative and imaginative, her choices are both precise and creative. Fatos’s concepts for this year’s Art Night deal with important socio-political questions, there is an urgency to her ideas yet the way she approaches them is non-didactic, she allows works to speak with lightness. When Fatos asked me to be part of her programme of commissions I was delighted to be able to make a new work in this context. Presenting art works outside of the usual parameters of the art institutions opens out meaning and potentially reaches new viewers. My work has a strong performative and participatory focus, it forms a continuous enquiry into the dynamics of individual and collective identities. There is a strong dialogic and relational approach to how I conceive work, hence presenting the work in new contexts is a great opportunity to expand its vocabulary. Art Night is allowing me to be ambitious with ideas that are part of some earlier works: my projects often propose constructed events or situations in public spaces and form explorations into our human condition, forming a dialogue on ways of being and belonging. The works operate on the threshold of choreography and observation, of documentary modes and staged scenarios or performances – working with an economy of gestures to articulate relations orchestrated by and around the camera. 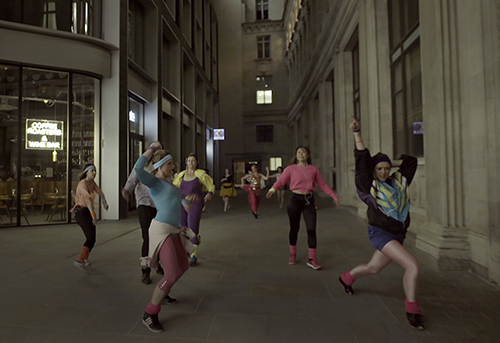 Dance (All Night, London) is both an action, a live event as well as the production of a new video work. I am interested in the blurring of the spaces of participation and of observation, the possibility to difuse the boundaries between performers and audiences. In Exchange Square, where the piece takes place, arguably every one is a participant, we are all performing together. Why did you chose to work with dance/movement for this piece? Dance has featured in a number of previous works of mine, I have a strong and sustained interest in dance as one of the most profound expressions of our cultures and our histories. It connects us deeply to ourselves, to our subjectivity yet also to forms of collectivity and intersubjectivity. Different forms of dance are all different languages, they have their own vocabulary, grammar and syntax. Each stands for its own specific history, its provenance, its connections to rituals. Working with ten different dance schools, each representing a specific form of movement and all located within the East End, is speaking to the broad diversity of cultures present with the East End and by extension in London. We are in danger of loosing some of the richness of this hugely diverse demographic, in part due to the divisive politics of this current moment. Dancing with strangers in public, temporarily reclaiming spaces that are highly regulated and codified is a powerful act. It is suggesting that we can produce moments of exchange and togetherness, it aims to recognize our entangled relationship with the world and with each other. The exploration of public spaces has seemed to be a recurring theme in your work – is there something particularly appealing about bringing art into public spaces? Why are you drawn to creating work in these spaces? My whole practice is characterized by a research-led approach to devising individual projects that respond to specific locations, situations and communities. An exploration of public space and our relationships with different types of environments is one key parameter of all my work. What we think of as ‘public’ space a lot of the time is in fact private, owned and authored. I am interested in playing with the codes of these spaces, provoking a recognition of how public space is highly regulated and how this affects our behaviour within it. In looking into ideas of personhood the very questions of the locational aspect of identity is significant. Our relationship to the environments we live in is constituent of who we are. I strongly believe that there are continuous reciprocal relationships between people and their socio political context. Dancing in public reclaims space for an activity that is at once celebratory and potentially disruptive. Think of carnival: it is joyous yet always carries within it the seed of protest. Dance (All Night, London) consciously explores that dialectic. How will you be utilising the whole of Exchange Square in your work? The dancers will stream into and across Exchange Square at the end of their processions through the streets of East London and we will use all of the six entrances into the square – this opening moment will activate the entire square and then pull in into the central focus of the work, the temporary dance floor we are setting up for the night. Viewers and participants are encouraged to get headphones from the silent disco sound system as these will allow them to tune into the three different channels of music that will run in the square for the entire night, from the moment the dancers arrive and the dance lessons start. So whether you decide to learn a new dance and join one of the ten free lessons or whether you want to observe and listen and flick between the three channels to tune into each lesson – the headphones connect you to all the other people who are listening to the same channel. From 9.30pm to 4am the square will be a continuous celebration of dance in many of its varieties. As the entire event is running on silent disco headphones the square might actually be relatively quiet and I anticipate that this will create a very unusual atmosphere. The silent disco system fulfills an important conceptual function as it highlights each visitor’s responsibility for their specific experience. If you watch the event without headphones your perception will be completely different to observing it with headphone By tuning into one particular music you connect with others on that same channel, your rhythm will align or be more in tune with people listening to the same tracks. If I turn up ready for the start of the dance classes, what will I learn? How will it differ from a studio class? It will differ in many direct and more subtle ways, beginning with the external framework for the work, in which the dance classes take place: the classes are all conducted on silent disco headphones and the dance floor will be divided into three sections with a rolling schedule of dance lessons so at any one point there are three dance lessons happening side by side. For example, if you are deciding to learn Tango, you will have other people learning Reggaeton and 80’s flashmob choreographies on either side of you. The setting for the project is pretty amazing, you are looking into the back of Liverpool train station and have the panorama of the City surrounding you. Dancing with a large group of total stranger can be a very empowering and connecting experience. As mentioned above, my work has a sustained interest in collective experiences, particularly when they take us outside of our own expectations, beyond groups of people we already are in connectivity with. The silent disco accentuates this, it connects and isolates at the same time. You are sonically connected to all the people on the same channel with you and your body is activated by the same beats yet there are always people right next to you who are on one of two other forms of music and their experience of their physicality, their connection to rhythm is potentially totally different. .
A lot of your work in the past has focused on the body and how it changes over time. Do you see dance as something that people can get involved with at any stage of their life? Absolutely! I think it is so important to keep dancing into your old age, I am always delighted when I see older people dance. Look at the Green Candle Dance Company, who are part of the work – their dancers are up to 86 years old – they are inspiring and beautiful! Can you tell us more about how Dance (All Night, London) will live on after the night itself? The work will become a video installation that will be exhibited in museums and galleries for years to come. We are absolutely delighted that the work has been acquired by the Art Fund and will join the Arts Council Collection as soon as it is complete. This will give the work a great legacy as the Arts Council Collection is such a strong national collection, preserving the work and making sure it gets seen in good exhibitions around the country.